Mine is white, indigo, violet, blue and green. 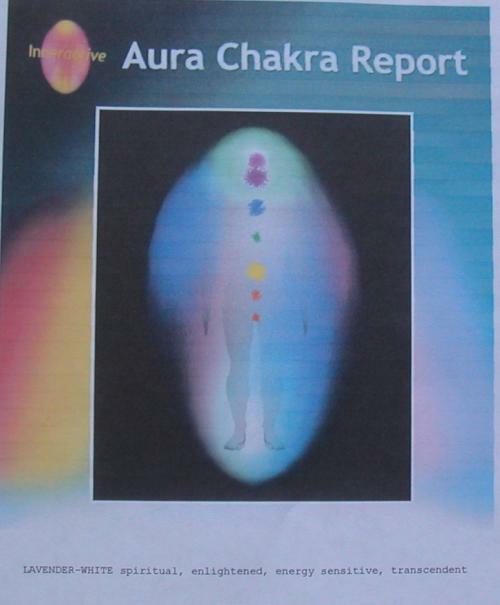 That’s what the aura and chakra photos I had taken yesterday showed. The photos took a couple of seconds, the interpretation nearly an hour. Anna-Maria of Shen Point (email delluomoannamaria@yahoo.co.uk) who did the analysis (reading) told me my chakras were unbalanced. Too much going on in the head and not enough in the heart. I needed to do more to open my heart. I was gob-smacked. There was such a massive shift on Sunday in the heart area. But then I remembered the dream on Sunday night with Gary Ranard telling me to do more exercises and meditations to open my heart. See blog Graveyards and pigeons. Also my sacral chakra was blocked. I need to get rid of anything superfluous in my life, and to eat foods that will aid bowel action. Much of what she said was very accurate. The only points I couldn’t agree on were those to do with health issues in my body. I’m pretty healthy and nothing untoward has been showing up. Take more rest, as the spiritual work, which is very intense at the moment,v is draining my energy and I’m not sleeping enough to replenish it. Get out more and have more fun, an essential counterbalance to all the spiritual work. Mix more with people in a social way. The writing is great, but it is isolating. Get back on stage with drama and dance. Clear out physical and emotional clutter. Well, I’m taking heed. The diary is filling up quickly with social engagement. Anyone up for a night out? I know some of you reading this are experts on chakras and colour, so if you want to add any comment about what you can see I’d be happy to hear it. I really do value you comments. Cool colours, have not seen colours around someone like that since that party in my 20’s :). One day I may get one done. Stumbled across this blog – intriguing that a photograph can be taken of the auric field. In my recent experience of intuitively ‘seeing’ aura colours, I ‘see’ 2 dominant colours that define a person, and this auric field changes as you change or as people around you change. 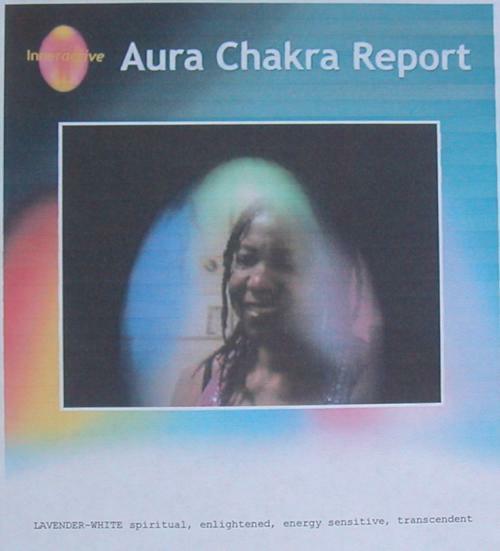 But calling a report ‘aura chakra’ seems illogical as you can’t look at auras and speak about chakras, as there’s a difference between both of them. Aura is the energy field around you, how you carry yourself in the external environment (your moods), whilst Chakras are energy points anchored within your body, i.e. how you carry yourself within you (your life story). Thanks very much for your comment Ivy Rose. I find aura photography fascinating. I’ve had a few done over the years and I agree with you that the aura reflects what is been shown/seen externally, and that the chakras are how we carry ourselves internally. I do believe, however, that how we are internally projects to the outside, so it’s fair to say that our chakras have some influence on our auric field. I believe that your moods are determined by what is going on with your chakras. I’ve never been able to see colours in a person’s aura. I sometimes see a white outline, but that’s about it. I’m interested that you say you see two dominant colours. Is it the same two colours for everyone or do you see mainly two different colours for each person you look at? How would those two colours define a person? I only recently started seeing aura colours, but it just came so naturally after being able to feel chakras more than a year ago. So perhaps in time you will too 🙂 but before you get there, you seem like you are in touch with your intuition, so you can certainly feel the auras of people as soon as you get within close range of them, if you aren’t aware of this – then start listening to how you are feeling when you move into close proximity with another, and you will become aware of others auras through your feelings.